GOP reversal on Confederate flag: Scott Walker, Rick Perry, and others finally find their courage—after S.C. Gov. Nikki Haley provides cover. 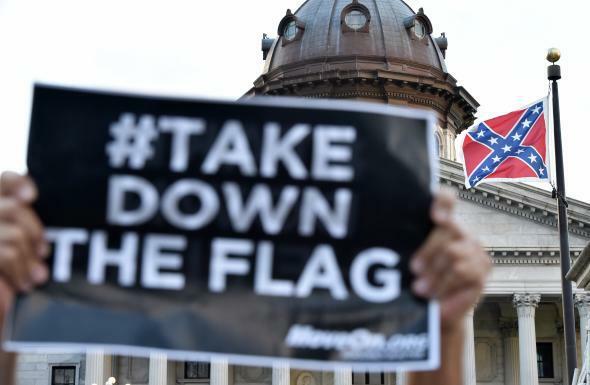 Hundreds of people protest against the Confederate battle flag during a protest rally in Columbia, South Carolina on June 20, 2015. Within hours of Haley’s remarks, a number of national Republicans who had previously avoided specifically weighing in on whether the controversial flag should come down suddenly found the courage to call for its removal. Scott Walker said that he was “glad” Haley said what she had and that he supports her decision. Rick Perry said that her new stance “honors the people of Charleston.” Likewise, John Kasich praised the South Carolina governor’s “leadership.” Republican National Committee chairman Reince Priebus offered a similar endorsement for removing the flag—“Now is the time to do what is right”—as did a number of high-profile GOP congressman, including House Budget Chairman Paul Ryan and House Majority Whip Steve Scalise. What a difference a little political cover makes. Before Haley’s press conference changed which way the political wind was blowing, none of those men were willing to come out publicly against the state-sanctioned flying of the flag that Dylann Roof appears so fond of. After, however, most of them conveniently no longer appeared bound by the same rationale they had been using to justify their decision to stay on the sidelines. Over the weekend, for instance, Walker dodged questions about the flag by saying he wouldn’t address the issue until the nine victims who were gunned down in Charleston’s Emanuel AME Church last week have been buried. His new opinion, though, comes four days before the planned funeral services for Rev. Clementa Pinckney, the state senator who was killed during last week’s massacre. Perry, for one, tried to remain crouched in that defensive position on Monday even as he joined the growing GOP choir. “The decision to remove the Confederate flag needs to be made by the people of South Carolina, and Gov. Haley’s leadership today honors the people of Charleston, and the families of the victims of last week’s horrific hate crime,” the former Texas governor said in a statement. Such an attempt to have it both ways is only highlighted by the fact that, under law, a final decision about whether to remove or relocate the flag will need to have the backing of two-thirds of the state legislature. While a number of state lawmakers stood behind Haley at Monday’s press conference, the final decision remains months away and remains uncertain. If Perry wants to wait for the people of South Carolina to have their say before he does, he’ll need to wait a good bit longer. The biggest outlier among the crowded field of GOP hopefuls was Jeb Bush. Following Monday’s press conference, Jeb also offered “kudos” to Haley and the other officials for “doing the right thing.” Previously he had said that he was confident that the state would “do the right thing”—although, notably, he stopped just short of saying exactly what that was. His decision to walk right up to the line without crossing it might not have been so frustrating if it weren’t for the admirable leadership he previously displayed as governor of Florida by relegating the Confederate battle flag that was then flying on the grounds of his state’s Capitol to the Florida Museum of History. One bit of good news out of all this political calculus and cowardice: Regardless of why and how the GOP hopefuls have finally found their voices, the fact that they have will put pressure on state lawmakers to follow Haley’s lead and finally take down a flag that serves as a painful reminder of the state’s painful history. The GOP field may have come by their courage conveniently, but the development is better late than never. Read more of Slate’s coverage of the Charleston shooting, and of the 2016 presidential campaign.